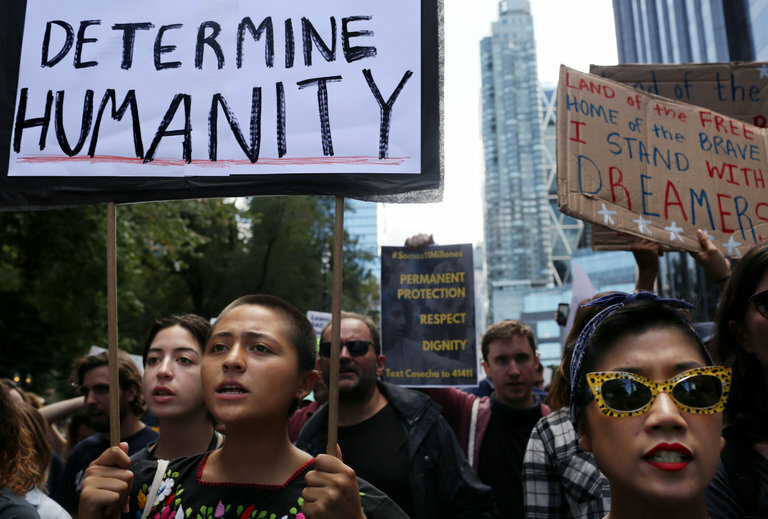 In September, the Trump administration canceled the Deferred Action for Childhood Arrivals program, which allowed young immigrants who were brought to the United States illegally as children to work and go to school without fear of deportation. Crowds across the country protested the decision. After nearly 100 applications to renew permits that let immigrants stay and work in the United States legally were rejected because they had been delayed in the mail, the United States Citizenship and Immigration Services agency last week said nothing could be done; the decisions were final. But on Wednesday night, the agency reversed its position. In light of the delays, it agreed to allow those rejected because of mail delays to resubmit their renewals for Deferred Action for Childhood Arrivals. The Department of Homeland Security’s acting director, Elaine C. Duke, told the immigration agency to allow applicants to resubmit their paperwork if they have proof that they mailed their renewal in a timely manner and that the reason it missed the Oct. 5 deadline was because of Postal Service mail delays. Homeland Security issued the guideline in a statement Wednesday night. The rejection of the delayed applications was reported by The New York Times last week. At least 74 applications from the New York area and Chicago were known to have been rejected as a result of mail problems in Chicago, for which the Postal Service took responsibility. The immigration agency said it was “not responsible” for mail delays. In New York, lawyers reported that 18 out of 34 applications had actually arrived at the Chicago location on Oct. 5, according to postal receipts, and yet were not accepted by the immigration agency until the next day. Officials from the immigration agency said they were still investigating the cause and location of the problems. Details about refunds for the $495 application fee and the date of the new deadline would be forthcoming, the agency said. On Sept. 5, the Trump administration canceled the Obama-era DACA program, which allowed nearly 800,000 young immigrants who were brought to the country illegally as children to work and go to school in the United States without fear of deportation. Those whose permits were expiring before March 5, 2018, were permitted to renew their application by Oct. 5 for a two-year period. The deadline led to a frenzy of 132,000 applications, according to U.S.C.I.S. At least 4,000 renewals were rejected because they were late, according to a government official in an Oct. 18 deposition in a federal lawsuit over the cancellation of DACA. It was not clear how many of those 4,000 were rejected because of mail delivery issues, and if that number has increased since Oct. 18. But as of Wednesday, the number of DACA renewal applicants who had been rejected because of mail delays had increased to 115, according to lawyers and lawmakers, including cases in Texas, Wisconsin, Washington State, North Carolina and Michigan. Senators and members of the House of Representatives sent letters of protest to the Department of Homeland Security this week. There are three U.S.C.I.S. intake locations, known as lockboxes, in the United States: in Phoenix, Chicago and Lewisville, Tex., a suburb of Dallas. All three were affected by the mail delays, according to immigration advocates. The lockboxes are managed by the Treasury Department, because checks are included in the applications, but a courier service picks up the mail and delivers it to immigration agency. Most immigration applications require that they be postmarked by a certain date, rather than received by that date. But the recent DACA renewal departed from that policy. “All of this could have been avoided by not having a very short arbitrary deadline and by responding to our concerns about having a received-by deadline,” said Kate Voigt, the associate director of government relations for the American Immigration Lawyers Association. The government had a deadline of its own to address the mail delays because of continuing litigation. A hearing is scheduled in Brooklyn on Thursday morning in the federal lawsuit disputing DACA’s end. On Tuesday, the three plaintiffs — two immigrant advocacy groups and a legal services organization from Yale Law School — wrote to Judge Nicholas G. Garaufis of Federal District Court in Brooklyn asking to amend their original complaint to include the issue of the rejected applications because of mail delays. Angela Fernandez, the executive director of the Northern Manhattan Coalition for Immigrant Rights, an advocacy organization, sent out 15 DACA renewals on Sept. 26, all of which were hand-delivered by a staff member to the post office. All of those renewals were accepted by the immigration agency on Oct. 1, except for one. That application was marked “in transit” in Chicago and did not arrive until Oct. 6. It belonged to Simrri Juarez, 27, a television programmer in Manhattan. His wife, Hortencia, had her application accepted weeks earlier.